The Sloth Bear (Melursus ursinus), also known as the Labiated Bear, is an arboreal, nocturnal and insectivorous species of bear restricted to the Indian subcontinent. They are basically shy and therefore difficult to spot but can be ferocious when disturbed. We were lucky to find this one crossing the road and then rummaging in the bushes for food (ants, termites, fruits, plant matter). Awesome capture...I would love to see one of these..thanks for sharing! How fortunate to have seen this! Thanks for sharing the shot. What incredible luck to be able to capture this bear. How cool to come across this guy! Nice catch! Sloth bears do not hibernate. They make their day beds out of broken branches in trees, and will rest in caves during the wet season. 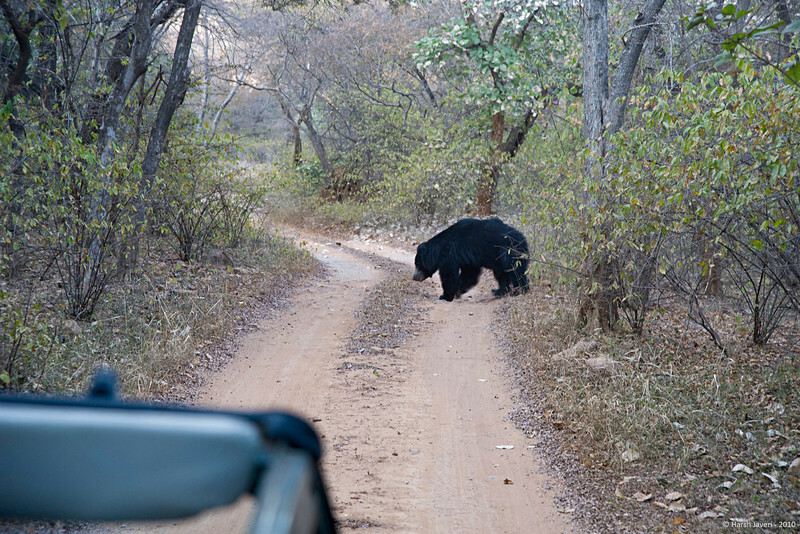 Sloth bears are the most nocturnal of bears, though sows become more active in daytime when with cubs.